This is what 10 years of paying off student loans looks like. I graduated with a BA in Political Science in 2008 (great timing!). I spent the next two years of the Great Recession occasionally unemployed or underemployed. I made small token payments when I could, but had to rely heavily on forbearance to keep my debts from defaulting. 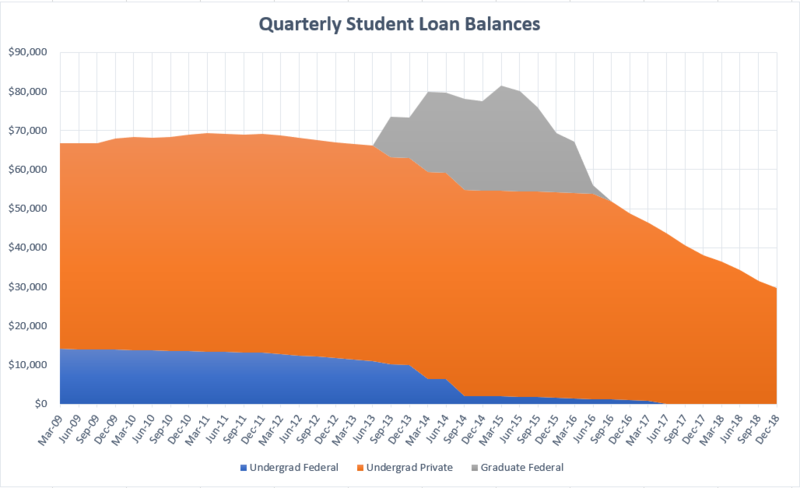 During this time, accumulated interest began capitalizing into principal, which meant that despite putting some money into my loans, the principal owed largely stayed the same. I finally got a job worth talking about in 2011, but quickly saw how near I was to my earnings ceiling. I decided to go to Grad School in 2013. I worked in various temp jobs & paid internships while a grad student and paid every spare dime into my student loans. After graduating in 2015, my first real job came with a 50% raise over my last pre-grad school job. Over the next couple of years, I got a couple of raises/promotions and am now finally in a financially comfortable position. I consolidated my remaining loans to a good fixed interest rate with my credit union last year and I’m on track to have my loans completely paid off in the next 3.5 years. The capitalized interest was a huge killer. It ballooned my principal and accelerated the accumulation of interest. This kept me down during the most financially strained years of my early working life. A slight silver lining of the recession was the low interest rates that came with Quantitative Easing, which kept my variable rate private loans from accumulating even more interest. The fact that I have paid more into my loans to-date than the cumulative initial disbursements were worth with $29K to go is discouraging, but I can at least see the light at the end of the tunnel. Had I known the kind of long-term financial brake these loans were going to have when I was 18, I would have done things very differently. However, what’s past is past and I can only control the present. All I can do now is take care of my debts, advocate for change to this terrible financial situation for higher education, and put extra money into my daughter’s 529 to mitigate/eliminate her own financial burden if/when she goes to college. *By “re-characterized” I mean grad loan leftovers that were immediately used to pay down undergrad loans with higher interest rates. You can see this by the stair-steps up & down in 2014 on the chart. Let my parents in 60s file bankruptcy, or bail them out?